WATERLOO, Ont. - BlackBerry is hoping not only to return to the hearts and minds of smartphone users but, starting next year, the company wants to get into their cars and homes too. With its finances slowly improving, plans are being made for the Waterloo, Ont.-based company to become a bigger player in the Internet of Things movement, which links your phone with various other technology, from your fridge to your television. The project has been in development for several years at BlackBerry, and chief executive John Chen said Friday that a "roadmap" for his plans will be laid out in early January at the Consumer Electronics Show in Las Vegas. "Our focus right now is on connected cars, and it will get into connected homes — these things are inseparable," Chen said during a recent meeting with reporters at the company's headquarters. "Everything we do fits together." Still in its infancy, the connected home is the next evolution in technology as more people link their smartwatches with their laptops, and their phones to their bluetooth speakers. BlackBerry is trying to get ahead of the curve by developing security software that can be licensed to companies who want their products ready for the growing popularity of machine-to-machine communication. Coming up with innovative ideas would've been almost unheard of a year ago when the future of BlackBerry was tenuous, at best. The company was drowning in problems and its finances were declining at an alarming speed, with quarterly losses that soared into the billions. When Chen swooped into the leadership role in late 2013 he immediately launched a rescue effort, a strategy that has partly relied on thinking of new ways to sell the company's older technology, while it worked behind the scenes on fresh ideas. The approach baffled some analysts but, during the past months, sentiment has shifted towards a likelihood that BlackBerry will survive, albeit as a smaller version of its former self. Shares of the company have climbed more than 45 per cent in 2014, closing at $11.55 on the Toronto Stock Exchange in late December, after starting the year at $7.90. "The question is, where are we going to find growth?" said Desmond Lau, a technology analyst at Veritas Investment Research Corp.
"That's still an important question, but it's not a life or death question." A year ago BlackBerry needed rapid changes and Chen made several key decisions in 2014 that would ensure its survival, such as reeling in expenses, cutting staff and shifting the marketing priorities back to the business community that first fell in love with the smartphone. Chen said he still needs "a couple of quarters" before the top-line results meet his expectations. He's also stuck to a goal of making the company profitable by the middle of next year. 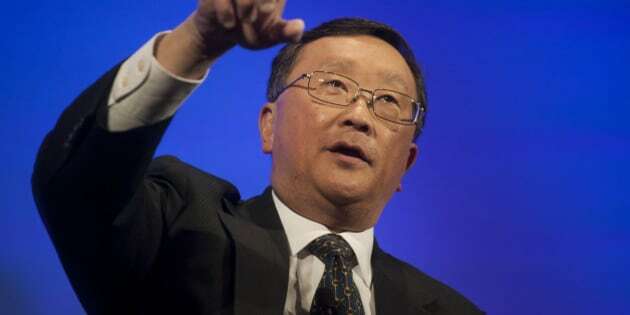 "I'm going to start making money (for BlackBerry) ... and once we make money we're going to sustain it," Chen said. "Sustained profit needs to come from growth, it's not coming from cost-cutting." Envisioning how a reimagined BlackBerry company looks can be difficult for outsiders, especially since most people still consider the company a smartphone maker first. More than half of BlackBerry's revenue now comes from software and services and there's a clear shift of its business strategy into new markets that could help rebuild its reputation. In automotive, BlackBerry is partnering with some of North America's largest car manufacturers. It recently secured a deal with Ford Motor Co. to develop their "infortainment" systems that link vehicles with the driver's smartphone, streaming music and maps. Versions of the technology, developed by BlackBerry subsidiary QNX Software Systems, are already installed in cars from General Motors, Hyundai and Volkswagen. In high-level government security, BlackBerry is working with Boeing to develop software for the Boeing Black, a smartphone that self destructs if it's tampered with. The technology will be marketed by Boeing's defence contractor division to security clients around the world, said Boeing spokesman Andrew Lee. BlackBerry is also targeting the business community with software that provides an extra layer of encryption. For an additional cost, the slate of programs bulk up phone security, making sure that instant messaging service and a virtual conferences can't be hacked. Yet the BlackBerry still wants to make handsets, much to the dismay of some analysts who think the company needs to surrender to the growing dominance of Apple's iPhone and Samsung's Galaxy models. Two new keyboard smartphone models were recently introduced — the BlackBerry Classic, which harkens back to the design its top-selling older models favoured by business customers, and the Passport, a device with a larger screen made for people who read a lot of documents on their phones. "The company seems hellbent on believing in fairly robust order numbers around the handset business," said Max Wolff, chief economist at Manhattan Venture Partners. "They still think that devices sell because of the actual device." Wolff argues that BlackBerry needs to scale back on designing handsets because the phones aren't selling in big numbers. In the third-quarter, which ended in November, BlackBerry's revenues declined mainly on weakness in sales of smartphones. Wolff said he's concerned that technology leaders like Apple and Google have built user-friendly operating systems that became one of the biggest selling features of their smartphones. BlackBerry doesn't have a "compelling operating system" that would attract most smartphone users, he said. "Somehow BlackBerry missed the operating system movement, which is just plain scary," he added. Despite the criticism, Chen wants to stick with making phones, which means that BlackBerrys will continue to be on the shelves at retailers for the foreseeable future, whether they're selling or not. Updated sales figures for the Passport weren't provided by BlackBerry in the latest quarter, and it also chose not to announce how many Classics were pre-ordered, other than to say it was somewhere north of 200,000 units. Even if consumers don't warm to the latest BlackBerry phones, there's still plenty of opportunities for the Canadian company, said Carmi Levy, analyst and writer at Voices.com, a London, Ont.-based web technology company. "It's fair to say you can be hugely successful and absolutely unsexy," he said. "Investors don't really care how much coolness BlackBerry has attached to it, as long as the company is making them money."